Big names in auto industry earn their reputation because of many reasons but surely high-performance versions are one of the important pieces in the puzzle. They maybe don’t bring the biggest piece of sales but at least their important task is to attract attention of the buyers. Similar is in the pickup truck industry. From time to time, big names in this niche offer their high-performance machines but in case of the pickup trucks these are high-spec off-road versions. However, there is only a few of this kind in industry. Of course that Ford is one of them with its second generation Ford Raptor which was introduced recently after a few years of production hiatus. Another similar piece of machinery which can be compared with Ford’s Raptor is Chevy’s Reaper model that is based on the Silverado 1500. It actually was unveiled in 2014, in the moment when Raptor had temporarily gone from the production. This model attracted a lot attention and it was built in joint venture between GM’s Lingenfelter and Southern Comfort Automotive. Like Raptor, this model also includes a hard-core off-road hardware, unique styling and powerful engines. Now, when Ford introduced new Raptor version, some reports claim that Chevy is designing a new Chevy Reaper Concept model. Details about this project are still very limited and unconfirmed but some assumptions have been made. As far as design in concerned, the new Chevy Reaper Concept is expected to use similar strategy that was seen on the current model but it will get modernized and upgraded approach. That means that it will showcase rugged, off-road oriented exterior design which reflects its capabilities and also includes necessary characteristics which will provide safe off-road ride. So, model will feature large unique wheels with off-road tires, high suspension travel and ground clearance. Front side will include bumper design which enhances ground clearance and approach angle and also includes large skied plate. Up front will also be new grille and modernized headlights and model will also have long nicely sculpted hood. Large fender flares, side body panels sculpting, attractive unique graphic and taillights will also add to its appearance. Inside model will offer a lot of space because it will come in crew cab form and it will also be fitted with modern equipment. Interior design will comprise well-designed dash which houses easy to use controls and large center screen which is the heart of the upgraded infotainment system. It will provide modern connectivity options, navigation, strong sound system, etc. Interior will also use high-quality materials and unique contrasting stitching and inserts which will give it modern and distinctive appearance. It will also get improved safety equipment and some advanced options will be added. When it comes to the engines, it is still a question what Chevy will place under the hood the new Chevy Reaper Concept model. 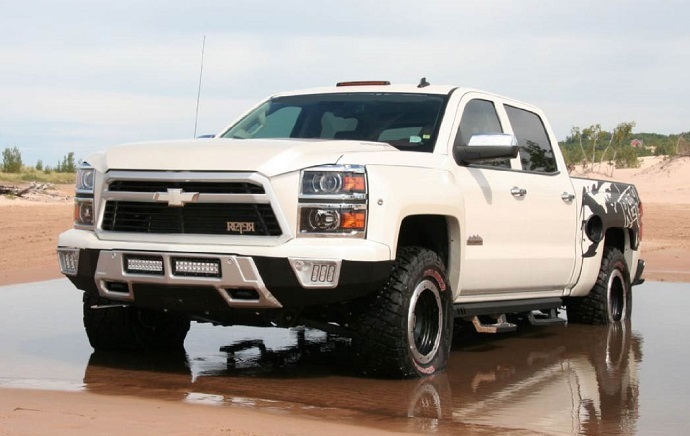 The current model uses two V-8 engines which adds supercharger on Silverado’s 5.3 liter and 6.2 liter engines for outputs of 475 hp and 550 hp respectively. The similar engine sizes were used by the first generation of Ford’s Raptor but new generation now exploits a smaller, twin-turbo 3.5 liter EcoBoost V-6 engine which promises to overpower larger V-8 unit. Perhaps, the Chevy might use the similar approach and equip new model with smaller V-6 engine. It is also expected that model will add new transmission and will go with four-wheel drive system. On the other hand, it will also get upgraded suspension and chassis. The frame will get high-strength steel infusion which will improve its rigidly for improved stability and off-road and towing ability but will also shed some pounds which will have positive effect on the fuel economy. It will also use upgraded Fox Racing Shocks and other suspension components while it will also get improved, long life brakes. It certainly sounds intriguing and promising that Chevy is preparing new Chevy Reaper Concept model. However, it will have to pass more time and more information to come before we will have more reliable picture about this model. The same is with its release date and about possible production model. However, according to some reports this model should see the showrooms sometime in 2017.